As the motorized vehicle progressed from carrying one or two people to thousands of pounds of cargo, the requirements of the braking system changed. Standard sized hydraulic brake systems found on the automobile could not safely be used on trucks. At that time, trucks were of the straight type with no articulation. The solution for the bigger vehicle was to just make bigger brake components, and this is still the case today. Hydraulic brake systems are still used on straight trucks with a gross vehicle weight rating of 26,000 pounds or less. As the desire to haul heavy loads increased, combination commercial vehicles were developed. Drivers needed to connect and disconnect to different semi-trailers from once a month to several times a day if the system used hydraulic fluid as the pressurized medium. There would be some fluid loss every time the brake lines were connected or disconnected between the tractor and semi-trailer. Eventually the fluid reserve would be depleted, which adversely affected the brakes unless the driver constantly replenished the brake fluid supply. In addition to fluid loss, air would enter the system which would greatly diminish the stopping ability of the vehicle. As a result of these shortcomings, in 1949 brakes operated by a pressurized air system became the standard for combination vehicles and buses. Both the hydraulic and the air brake system will be described. Since the air brake system is more complex and leads to more problems, it will be discussed in much greater detail. 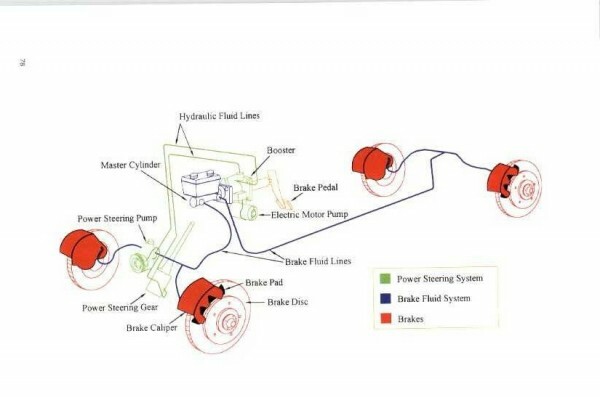 The hydraulic brake system on a truck is very similar to what is used on automobiles, although all of the components are larger. A schematic of the system is shown in Figure 1-1. It can be observed that the system is not very complex. As in an automobile, the driver will stop the vehicle by pressing on the brake pedal which moves a pushrod against the brake booster which is located in the engine compartment. The booster amplifies the force of the pushrod with the aid of the vacuum created from the power steering pump. The force is then applied to the piston in the master cylinder. The master cylinder typically contains the brake fluid reservoir that holds excess fluid. As the pushrod pushes on the piston, the piston travels down its bore and begins to increase the pressure in the brake fluid not only in the master cylinder but also in the brake hoses that are connected between the master cylinder and the wheel cylinders. Figure 1-1. A hydraulic brake system rather than air brake system may be used in vehicles weighing less than 26,000 pounds. With disc brakes, there are no wheel cylinders, instead there are calipers. The wheel cylinder is a hydraulic cylinder with a piston on each end and the brake line enters at the center of the cylinder. As the fluid pressure in the brake lines increases, brake fluid is pushed into the wheel cylinder and the pistons extend outward. The purpose is to push the tree end of both brake shoes into contact with the rotating brake drums, thus causing friction, thereby slowing the vehicle. Depending on the design, there may be one or two wheel cylinders mounted to the brake backing plate at each wheel that is equipped with a drum brake. The backing plates are located at the ends of each rear axle and on the front axle spindles. The rear wheels and drums are mounted on the rear axles while the front wheels and drums are mounted on the spindles. The purpose of the backing plates is to anchor and transfer the retarding force of the brakes to the truck chassis. The plate is in the form of a circle and has a reinforcement lip at the edge. The brake shoes, brake adjuster and wheel cylinder are mounted to the plate. Each time the brakes are applied, a small amount of the brake linings and rotating drums is worn away as they come in contact with each other, the brake adjuster mechanism that is typically mounted at the bottom of the backing plate compensates for this wear and maintains the brakes in proper operating condition. The brake adjusting mechanism should work automatically. With disc brakes, there are no wheel cylinders, but instead there are calipers. The wheel cylinder is a hydraulic cylinder with a piston on each end and the brake line enters at the center of the cylinder. As the fluid pressure in the brake lines increases, brake fluid is pushed into the wheel cylinder and the pistons extend outward. The purpose is to push the tree end of both brake shoes into contact with the rotating brake drums thus causing friction, thereby slowing the vehicle. Depending on the design, there may be one or two wheel cylinders mounted to the brake backing plate at each wheel that is equipped with a drum brake. The backing plates are located at the ends of each rear axle and on the front axle spindles. The rear wheels and drums are mounted on the rear axles while the front wheels and drums are mounted on the spindles. The purpose of the backing plates is to anchor and transfer the retarding force of the brakes to the truck chassis. The plate is in the form of a circle and has a reinforcement lip at the edge. The brake shoes, brake adjuster and wheel cylinder are mounted to the plate. Each time the brakes are applied, a small amount of the brake lining and rotating drums is worn away as they come in contact with each other. The brake adjuster mechanism that is typically mounted at the bottom of the backing plate compensates for this wear and maintains the brakes in proper operating condition. The brake adjusting mechanism should work automatically, but if it falls a little behind, the mechanic can operate the adjusting mechanism manually. Automatic brake adjusters were required on all new hydraulic-braked vehicles after October 20, 1993. The caliper is part of a disc brake system and is mounted to the axle or spindle of the truck. It is in the shape of a “U”. It houses the hydraulic pistons that move out of their housing and push on the brake pads that in turn squeeze the rotor. Calipers may contain 1, 2 or 4 pistons. The rotor is a round disc that is part of the axle and wheel assembly. Brake pads are oval shaped pieces of steel that have a friction material bonded or riveted to their face. When pushed outward by the brake caliper pistons, the pads contact the rotor and create friction, thereby slowing the vehicle.